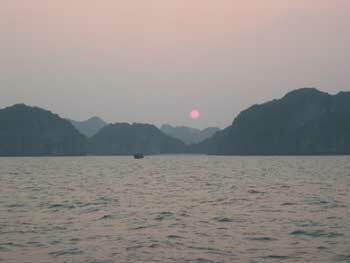 Pick up from your hotel in Hanoi at 0830 for a four-hour drive through the Red River Delta to Ha Long City. Arrive in Halong City we transfer to to a refurbished wooden sailing junk for a cruise through the limestone cliffs and emerald waters of Halong Bay, giving us the chance to take in the stunning scenery of this World Heritage Site. While on board we will be served a sumptuous fresh, local seafood lunchfollowed by a swim and exploring some of the limestone caves in this area. When the sun come down we drop anchor for the night nearby a remote island. * Have lunch with welcome wine. * Continue our cruise and take in such breathtaking view. * Enjoy 4 course diner and overnight on Junk. 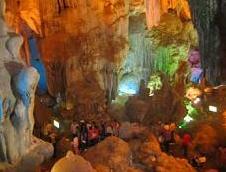 * Visit Bai tu long Bay , Teapot island , Chopstiks island , Bai tho mountain. * Return to Halong city and have brunch on board. * Back to Halong wharf and disembark Transfer back to Hanoi. Arrival Hanoi in the afternoon. Drop off at your hotel. The trip concludes in Hanoi.